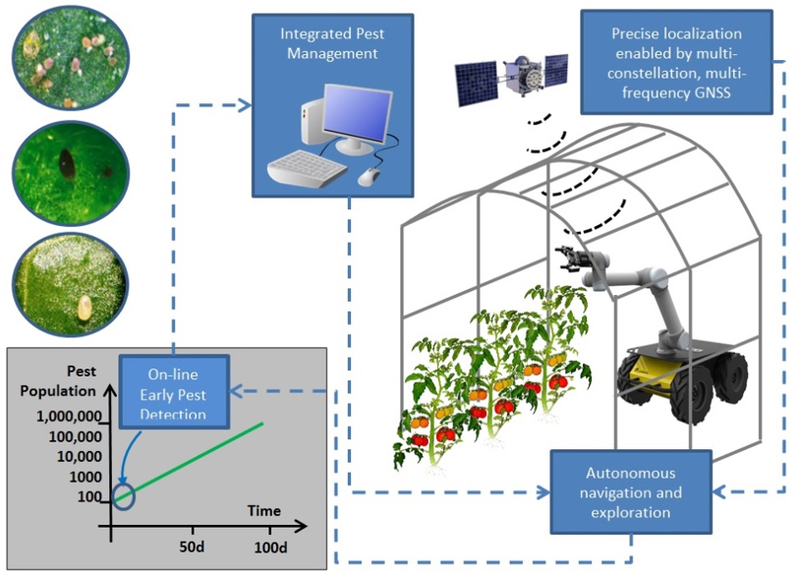 GreenPatrol is a European precision farming project aiming at developing an innovative and efficient robotic solution for Integrated Pest Management in Greenhouses. The robot will use the most sophisticated signals of satellites especially the Multiple-frequencies E1, E5 and E6 by Galileo, the network of European satellites for accurate global positioning. In crops, the accuracy of positioning and navigation is augmented by sensor fusion techniques. The Pest Management is provided by visual sensor and deep learning techniques. Furthermore GreenPatrol aims at developing a commercially exploitable end-to-end application prototype as a first step towards a commercial service. Greenpatrol produced a video explaining the project. The video tells something about greenhouse farming. How GNSS is used for the scouting robot to navigate inside a greenhouse and the importance of the European Galileo system. To produce more sustainable food. Six different partners participate in the GreenPatrol project: 3 European industrial partners (SMEs) and 3 Research and Technology Organisations, from 4 EU Countries. These Partners are active in the fields of Navigation, Robotics, Artificial Intelligence and Agriculture.